From State events around London to parades for our troops, concerts or Rock and Pop Bands, the Corps of Army Music Bands can be seen at events around the world. A number of Bands have visited Afghanistan, performing traditional military music and popular Rock and Pop music, something the troops can really engage with and join in. 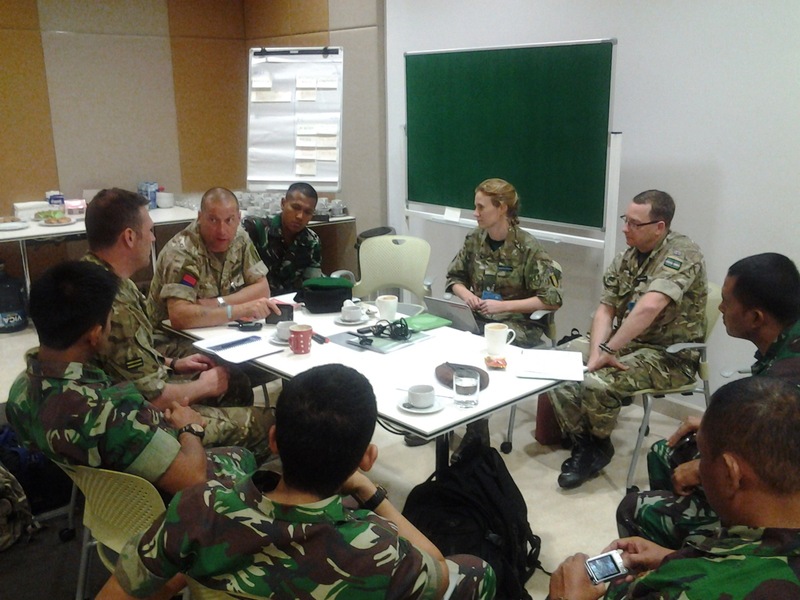 The Corps also has an operational capability; CAMUS personnel can volunteer for various roles from Driver to Military Stabilisation Support Group (MSSG). Musician Kate Bent is in the Band of The Parachute Regiment, part of the Corps of Army Music. 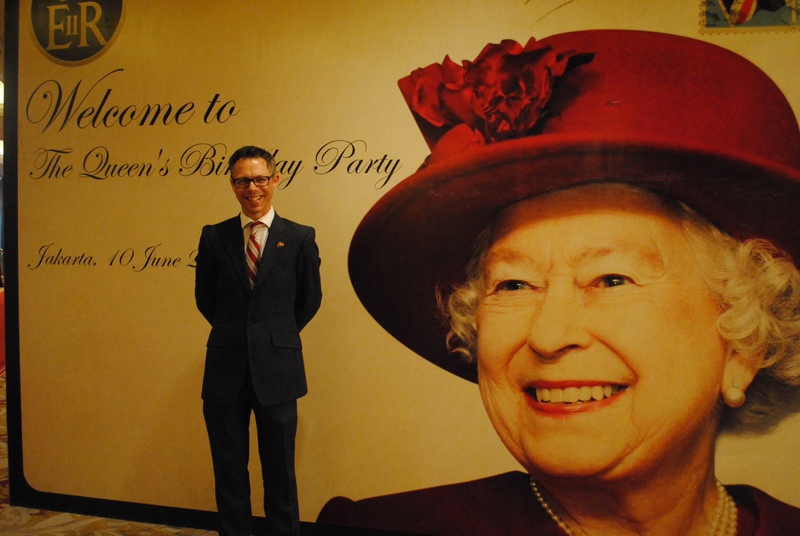 She plays the Saxophone and Rock Guitar and has supported troops with music around the world including Afghanistan. I first became aware of the PARAS’ 10 endurance race in 2009 when my Mum ran it in memory of my brother, Pte Joe Whittaker, 4 PARA, who was killed in action in Afghanistan in 2008. It’s a challenge I’ve wanted to undertake since, but the opportunity had never quite materialized until this year. 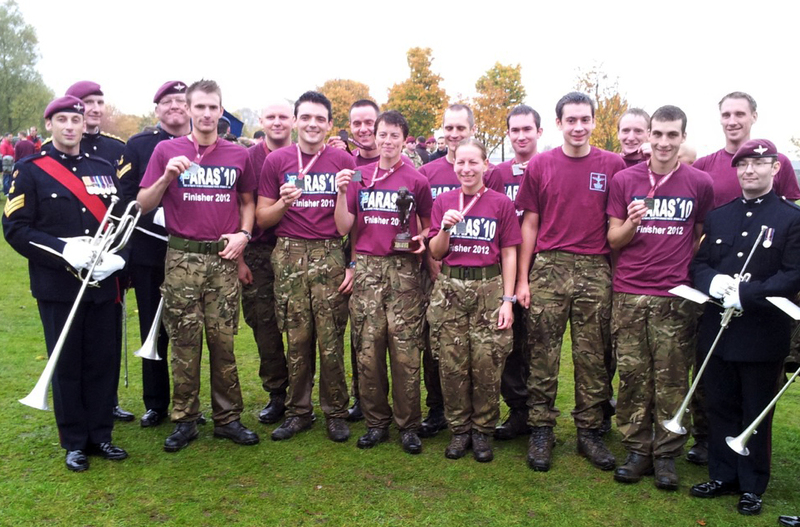 When I heard that there was to be a new PARAS’ 10 race to be held in our hometown of Colchester, I knew that this was the ideal time for the band to get involved. I had expected maybe three or four others to want to join me, so I was thrilled when 11 others signed up to the challenge. While many choose to run the course, the “P Company Challenge” of completing the gruelling 10-mile course in less than 1 hour 50 and carrying a 35lbs Bergen (rucksack), as undertaken by The Parachute Regiment recruits, seemed fitting for the Regimental band! As musicians (CAMUS), we undertake an 8-mile ‘tab’ once a year, but this involves carrying 15kg and we have a 2 hour time limit. 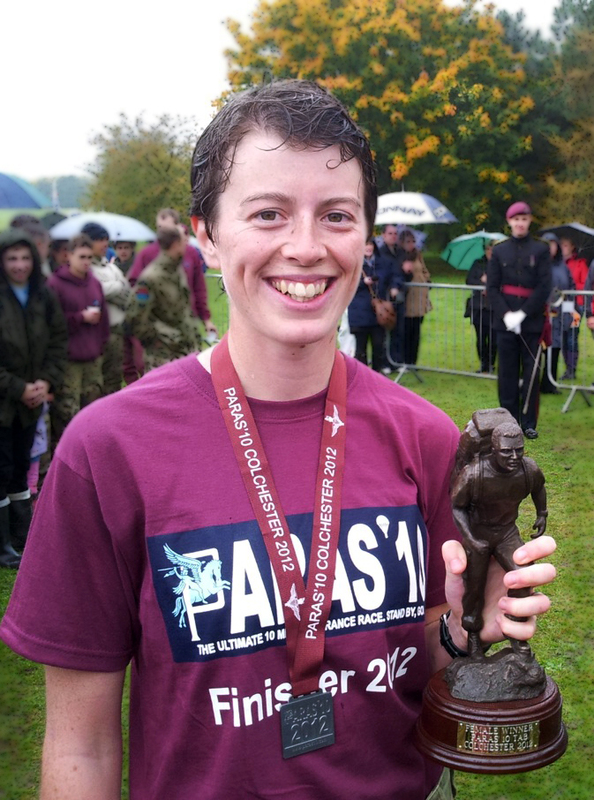 The PARAs’ 10 is 2 miles further, 6kg heavier and for those of us hoping to achieve the time, 10 minutes quicker! P Company isn’t a requirement in the band of The Parachute Regiment, but when we are on parade, we represent the Parachute Regiment, so one of my reasons for putting a team in for the race was to give the band a chance to see how we fare against the regiment’s tough standards. Music of course involves working together, but this is a totally different way of working as a team. Two band members have passed PARA training earlier this year and so their experience and high levels of fitness were very helpful when planning our training. I wanted to embrace the ethos of the PARAs by pushing ourselves and exceeding the notion of just doing what’s necessary. The support we have had from The Parachute Regiment Charity, the Corps of Army Music Trust and of course PARA Band has been immensely encouraging. Race day arrived early on Sunday 21 October (especially considering we only got in from a concert at 1 o’clock that morning) as we collected our race numbers and the PTIs weighed our Bergan’s. We met up with a few other musicians from the Prince of Wales’s Division and Heavy Cavalry and Cambrai bands, and were led through an entertaining warm up by the PTIs. The running race started at 11, followed by the “tabbers” 5 minutes later, and 542 of us fought our way across the start line for a good position. The course started through Merville Barracks, which was fairly easy terrain and a chance to make good time. I was certainly glad we’d done the first couple of miles fast as we were soon hit with all manner of obstacles to slow us down, from waist-deep water crossings to practically a whole mile of ankle deep mud. I’ve never seen so much mud in my life as we were faced with at the 6 mile point! Despite the energy-sapping nature of the course, we kept pushing ourselves, and the encouragement from the 16 Air Assault Brigade marshals spurred us through the last couple of miles. All of the band team did fantastically well, and either achieved or exceeded their expected times, mostly with smiles on their faces as they crossed the finish line! I was extremely shocked when, having been given my finisher’s medal, I was told that at 1:44.55, I was the first female to complete the course. This made it extra special for me when the Band’s fanfare team arrived to play for the prize giving and I was awarded the trophy for Fastest Female ‘Tabber’. 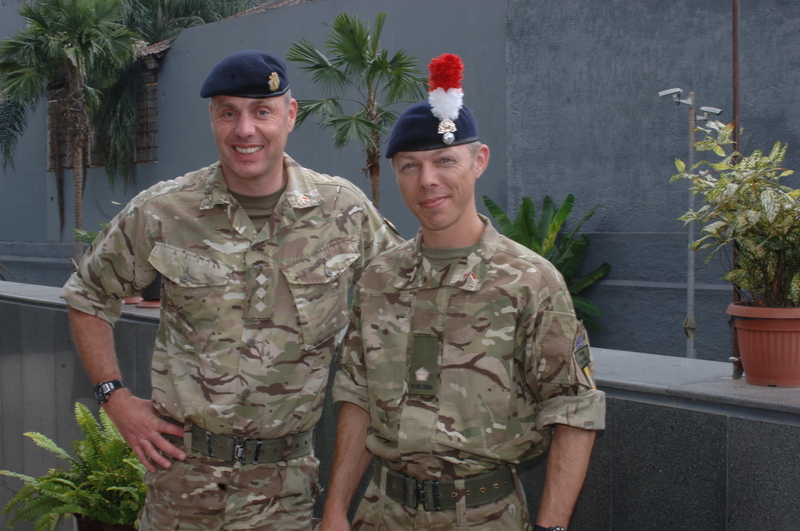 WO2 Marc Lovatt, part of the Military Stabilisation Support Group, blogs for the last time from central Helmand province. The operation to improve the standard of the road along the Patrol Base Line, known as Operation LMARIZ TUFAAN, has changed the topography of the landscape. Gone is the little copse of woodland 300m from our south wall. The abandoned mill has been turned into an abandoned brick pile, the little bubbling stream was… hell, where has that stream gone? Now, may I explain… if a bunch of guys with heavy plant equipment are told that an area is in need of being cleared and they have a limited time to undertake this task, but if necessary may use explosives – well, what is the likely outcome? Anyway, the Commander seemed happy with our new observational fields of vision and, after all, it would make sneaking up on us a lot harder for the insurgents; something they had been particularly astute at up until then! The road progressed rapidly and was being used effectively on a daily basis. However, with all this ‘construction’ local farmers had eagerly been piling into our PB seeking compensation. This kept me very busy most of the time which, when you are on a six month tour living in a dusty sun-bleached compound, helps to pass the time quicker. The negotiations about land, crops, felled trees, irrigation ditches and so on were often pretty mundane. Farmers! I mean even, thinking about it, though we were discussing points through an interpreter, I could quite as easily have been me talking to any group of farmers anywhere in the world. They were just concerned about the land, crops and the welfare of their families. Some of the locals did make me smile though. One old chap, claiming for trees cut down by ISAF along a river bank some 30 metres long, claimed that we had destroyed 1000 trees! I asked him which section of the Amazon rainforest he owned? It turned out that his trees were willows and he was counting the branches. I paid him for six trees. As the road took shape it was found that the engineers (good old lads) had blocked, albeit inadvertently, several irrigation ditches. Farmers arrived from further downstream with tales of drought-like conditions affecting their lands. I put the word out to the local villagers that I needed some able-bodied guys for some good old-fashioned manual labour. At first, a group of six men arrived, discussion ensued and we had a deal. They would work for five days to clear a length of ditch. I met them every morning at 6am to call the roll. Well, my interpreter called the roll. I was there in a managerial capacity you understand. Then I paid them each evening and away they went home. Word must have got out, as a few days into this routine a chargehand with some 15 men arrived at the gate. Off we went. I found work for these chaps. Then another gang arrived, so naturally I was able to occupy them. At the height of my industrial empire I had around 45 men working for me on one endeavour or another. Ditches were being cleared, fallen trees dispatched and culverts dug. Then, disaster! One sunny morning a volley of shots rang out over the area, AK47 type shots! My workers dived for cover but one was hit twice in the leg… The nearest Sangar (watch tower) returned fire but the culprits managed to flee. Fortunately my guy was all right and after some medical assistance from the ISAF guys on the ground the injured man was taken to hospital. I am happy to report that he made a full recovery. As I close, we have a dust storm blowing around us. Luckily for us the burn pit where the camp rubbish, including our excrement, is smouldering away is upwind so I am getting healthy lungfulls of desert dust and burn pit smoke… nice! This will probably be my last entry for now as I will leave the PB in a week or so and indeed the country at the end of the month. I must admit to have enjoyed the tour. It may sound strange to some readers but this has been an enjoyable and exciting place to be. It makes you feel alive, and hey it is 100% better than the 9-5 I have to go back to. That said, plans are afoot for me to visit the country next year (another tour) all being well. Keeps me young! Well OK, not exactly young, but hey, you know what I mean. I would like to end with some unadulterated heartfelt goodbyes and thank yous. This poem caught my eye. You’ve never lived until you’ve nearly died. 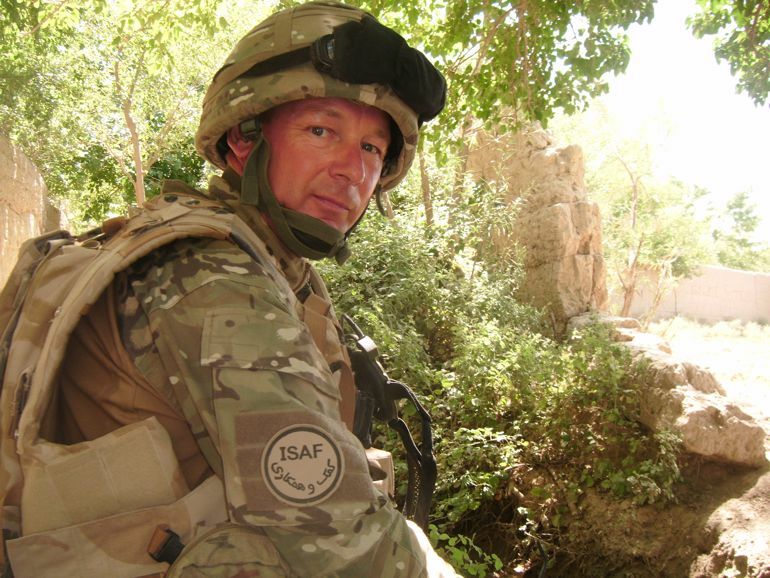 WO2 Marc Lovatt is working as part of the Military Stabilisation Support Group (MSSG) in central Helmand Province. Here he writes about implementing a subsidised seed scheme which has seen Afghan farmers growing new crops of vegetables. Not too far from the beginning of our tour we identified that the farmers around Forward Operating Base (FOB) Khar Nikar (KNK), might be open to the idea of growing alternative vegetables, rather than just corn or maize. The team at MSST NES (N) heard the call and made enquiries in an attempt to provide a solution. It was soon discovered that within the headquarters building in MOB Price, was an office of a member of the NGO AVIPA+, with a storage and distribution facility on the outskirts of Gereshk District Centre DC. Afghanistan Vouchers for Increased Productive Agriculture Plus (AVIPA+) is funded by the United States Agency for International Development (USAID) and implemented by International Relief and Development (IRD) in twenty provinces in Afghanistan. The original AVIPA+ program was launched in September 2008 in response to the prolonged drought conditions of recent years. Working closely with the Ministry of Agriculture, Irrigation and Livestock (MAIL), in 2008-2009 AVIPA distributed more than 10,300 tons of high quality wheat seed and some 33,000 tons of fertilizer at a reduced cost to nearly 297,000 vulnerable farmers, who also received training in best wheat production practices. Having spoken to the AVIPA+ rep, it was found that they could provide alternative seeds, along with fertilizer and tools all for around 1200 Afghanis per farmer. Each farmer would receive 4 x bags of fertilizer, a selection of spring vegetable seeds, (large tins or foil bags of: tomatoes, radish, cucumber, lettuce, spring onions, spinach and so forth). A member of MSST was then dispatched to KNK in order to gauge if there was any uptake from local Nationals (LNs) and to list those interested. On arrival at the FOB work began. The word was put out via the local Security Council regarding the seed, MSST accompanied patrols around the area engaging with locals and spreading the message of what was available, costs etc. A shura had also been arranged which did a lot to spread the word about the seed scheme. By the end of the next day over sixty interested farmers had registered themselves, or in some cases representatives had given names of villagers wanting to sign-up; within three days the list contained some 130 individuals. The MSST rep returned to MOB Price. However, the interest was such that locals continued to give their names at FOB KNK which the Coy passed onto MSST. The count reached 180, a quick calculation resulted in a total weight exceeding 35 tonnes and a halt was called. Undoubtedly there were those locals who would have been disappointed, but it was felt that any more would have been simply too much to transport in one lift. The AVIPA+ rep in NES (N), was given the details and duly delivered the merchandise; well he hired local workers who made the job of unloading 50kg bags look exceedingly easy! MSST, had had to ‘borrow’ three containers from within MOB Price in order to transport the 35-tonne load.These were placed outside the main gate for ease of access for the contractors. Once filled the consignment was loaded onto the next combat replenishment patrol (CLP) heading out to KNK, accompanied by the MSST consignee. Once on the ground a plan for distribution was discussed and next morning distribution began. 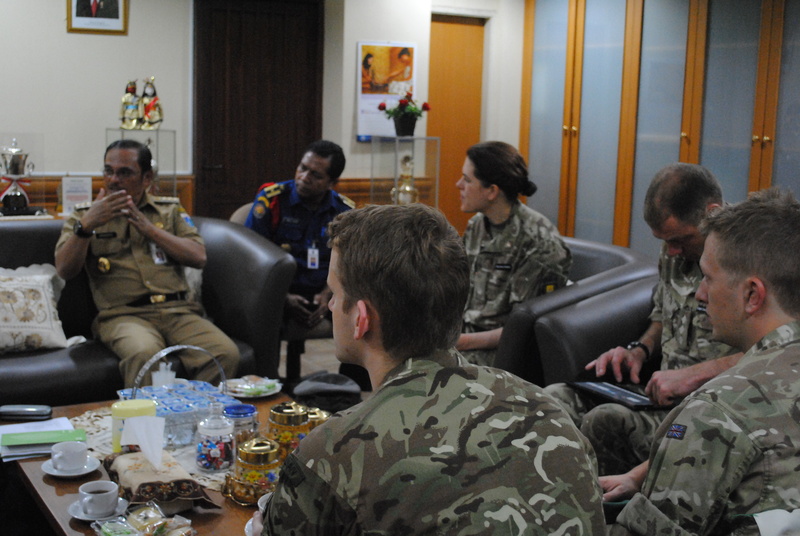 To ensure smooth running a team of able volunteers was put together, this included a Captain from The Mercian Regiment with some of his guys, the ANA Commander of FOB KNK and some of his men, an interpreter and the MSST representative. Twenty bundles were made up; four sacks of fertilizer, packages of seeds, a rake and a shovel per bundle. This proved to be ideal as each farmer could see immediately what he was to receive for his cash. He also knew he was paying a subsidised price. Over the next four days a queue was outside the FOB from 0700hrs until 1700hrs. The team worked steadily and the farmers and villages were happy with what they got. It can be said that as far as AVIPA, the loading and transportation, this was largely a matter of logistical balancing, timing and coordination. The containers are plentiful in theatre but getting one on an ‘official’ basis proved very difficult. Prior to distribution Tashkera (local identity cards), were used to identify farmers, thus cutting down on fraud. The sacks are heavy, a reliable workforce was essential. The locals were very keen on this project and wanted more. Moving house and meeting the locals. WO2 Marc Lovatt of the Royal Logistic Corps is working as part of the Military Stabilisation Support Group (MSSG) in central Helmand Province, Afghanistan. 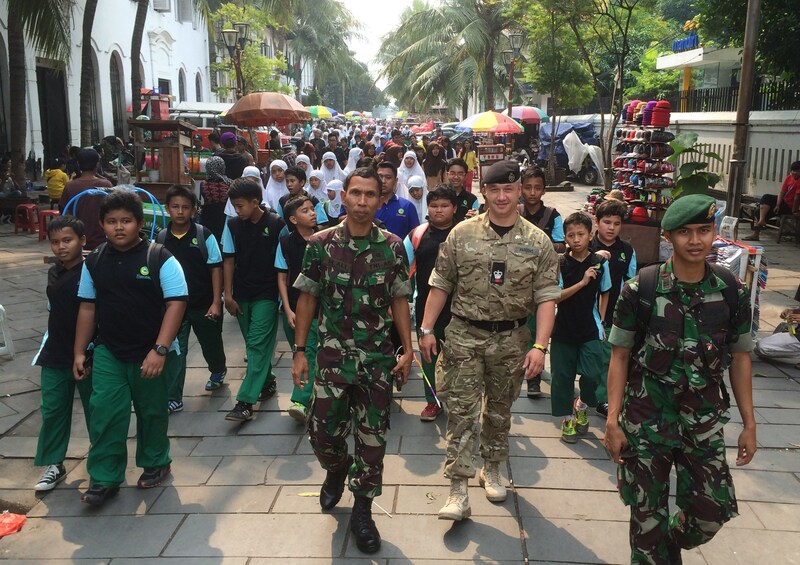 Here he writes about getting involved with an operation on the Patrol Base Line. Having been in Gereshk for around three and a half months, being into the ebb and flow of the daily grind, along with having my head around several endeavours, I was generally in a comfortable position. A lot of my recent time had involved working on agricultural matters. Afghanistan is a largely agrarian society so much of my work had been alongside the Stabilisation Advisor (STABAD) for Agriculture, but that will be another blog entry. Needless to say, the work has been enjoyable and got me out and about a lot including meeting a plethora of local government officials and other fascinating individuals. It was at this point that an opening became vacant at a distant location known as the Patrol Base Line or PBL. A large security operation had been planned for the PBL. I was to be the MSSG footprint on the ground, sorting out compensation and other concerns which the local inhabitants would undoubtedly soon be having. The Patrol Base Line is located in the Upper Gereshk valley on the edge of the green zone and consists of four small patrol bases which are located loosely on a South to North line, along a distance of around 2km. The views from many areas around Afghanistan are spectacular, and one can often see mile upon mile of cultivated lush fields within the green zone in one direction, and a panorama of desert in the other. These views can be even more impressive at various periods of the day, dawn and dusk in particular, and during the many varying weather conditions prevalent here in Afghanistan. A little background to the Patrol Baseline which may be relevant at this point. Around a year ago the bases along the line, which is intended to restrict insurgent movement into the wider Gereshk area, were manned by the Afghan National Police (ANP), however after many attacks these were withdrawn. 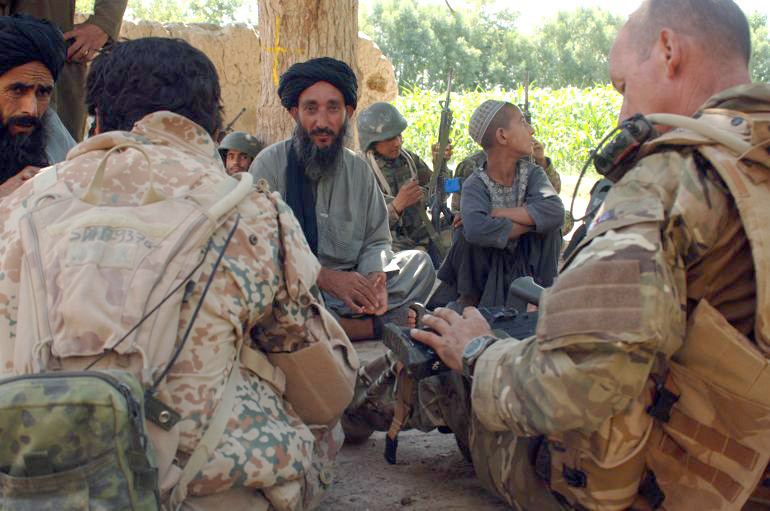 ISAF forces then took over the manning (mainly Danish Battle Group troops bolstered by UK Forces and Afghan National Army (ANA) troops), however, freedom of movement was restricted due to the poor maintenance of the road and IEDs. There was also a constant threat from attack, with many actual assaults being undertaken upon all the patrol bases. ISAF troops planned to remedy this. The ‘Plan’ outline was to remove all IEDs and improve the overall standard of the road, thus improving security and allowing dialogue and interaction to proceed more smoothly between local nationals, and ISAF Forces. This involved the deployment of many resources, and a large manpower commitment was diverted onto the site. A major concern was damage to the surrounding area and the MSSG, ie me, was there to meet local nationals, discuss what was happening, how we could minimise disruption and keep the populace on-side. The Operation began. 300 troops moved in, along with the headquarters element headed by a Danish Colonel. The pace was intense. The whole area was transformed into something akin to a building site. Looking out from PB Bridzar many of the fields were soon engineer parks piled with aggregate or stones and as for the new road, that was looking very impressive. In order to engage with the local nationals I asked if a patrol to nearby villages could be undertaken. So along with the ANA, and a number of their UK advisors, a patrol went out to the village of Sorani. It was like a ghost town. The patrol quietly walked around the tree-lined pathways between the houses and myself, with a few Afghan soldiers, wandered into an open area. After a few moments one local man came out to speak to us, then a couple more, then some children and fairly soon we had around twenty individuals gathered around us. After some formalities I found myself sat among a group of villagers as we discussed the road project unfolding on their doorstep. Naturally they were all very concerned about the impact upon their fields, crops, village and surrounding area. I did my best to field the array of questions and worries that these people had, who it must be said rely largely upon the contents of the fields for their very existence. We discussed the possibilities that ISAF could bring to the area in the form of wells with hand-pumps, solar panel street lights, bridges for better access to fields along with something nearly all of them had mentioned… improved security for the area. 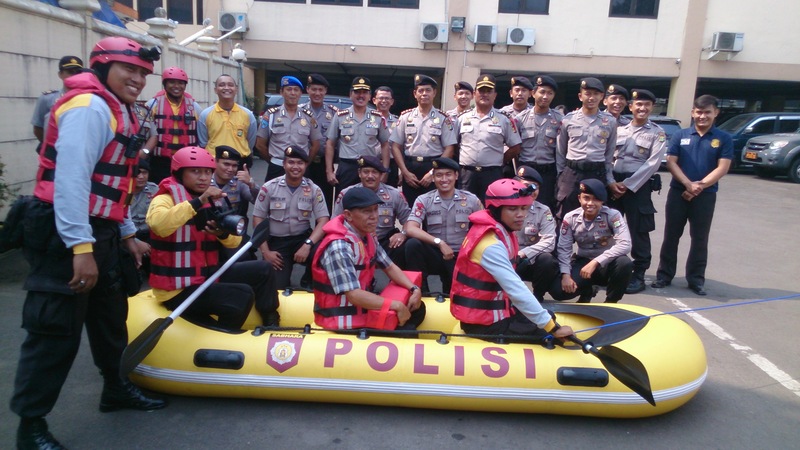 Due to those security concerns, the patrol Commander ordered that we move on for now. So with the message that if they had any concerns regarding their lands, or indeed if the villagers thought they could benefit from some aid from ISAF they should come to the nearby base, we moved on. As we left I thought about how impressed I was that these men had come out to talk to us. As we passed through the village the patrol stopped to rest and drink. Suddenly a door behind me opened and a man passed out to my interpreter two large flatbreads. We sat drinking our water and sharing the bread in the shade. Afghan generosity is legendary. I was sitting in my office back in October 2009. My civilian job as a secondary school teacher in a busy inner-city district was wearing me down and it was, I thought, time for a change! Taking the plunge, and having contacted the Regimental second-in-command, I emailed a short note of my wish to be mobilised and my civilian CV to Manning and Records in Glasgow. Only days later I received a call from our Training Major outlining a job in Afghanistan. 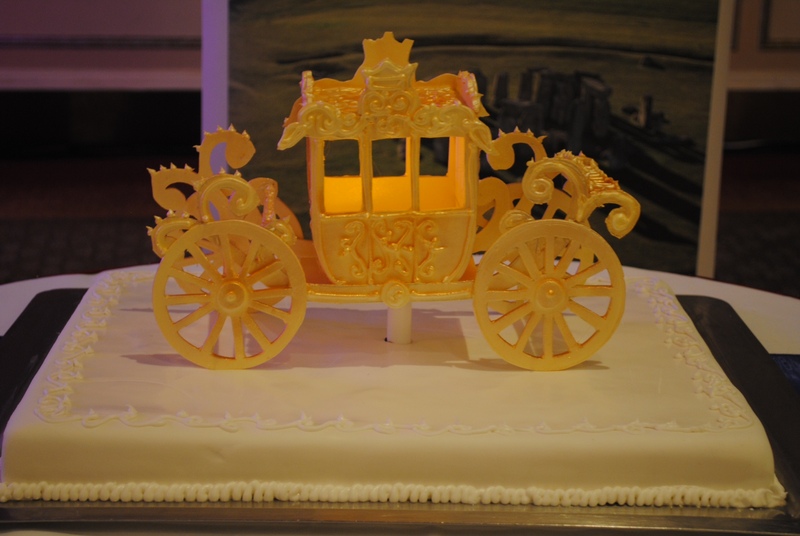 The details were sparse but it sounded interesting. It also meant beginning training at Chilwell on 2 November, around three weeks away. But in for a penny, I thought. The two weeks at Chilwell were both interesting and challenging. The standard training we had done helped, along with the enthusiasm and empathy of the instructors keeping us on track where needed. After completing the fortnight, passing all training and now in possession of a car full of new clothing and equipment courtesy of the QM I was off to the town of Shorncliffe and Operational Training and Advisory Group, (OPTAG) training. OPTAG involved a week of various stands and briefings pertaining to life and operation in Afghanistan. That was an interesting eye opener! Thus, once the preliminaries had been undertaken I could begin specific training for the job. 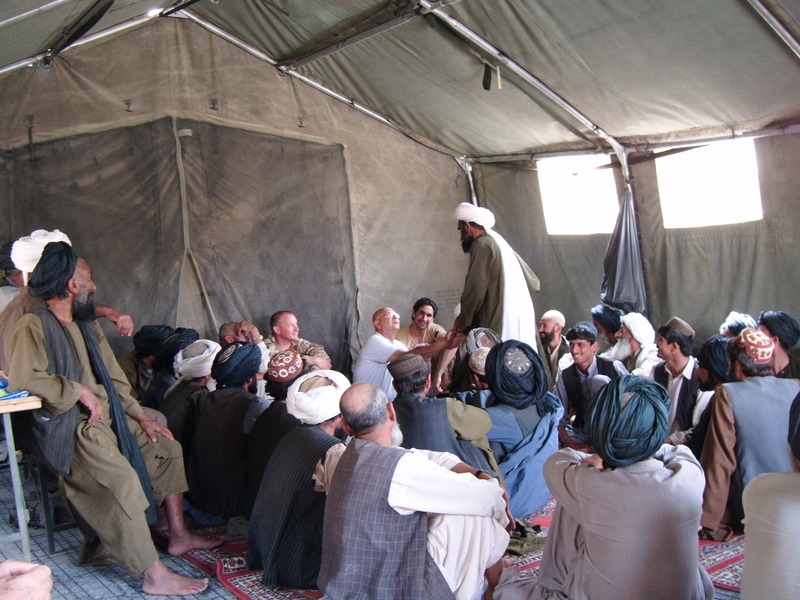 The Military Stabilisation Support Group (MSSG) is an organisation involved in the rebuilding, construction and development of the many war-torn areas of Afghanistan. Members of the unit are embedded within routine patrols with the aim of making contact with and talking to local people, with a view to understanding local issues and the needs of communities. This information is then used, along with that gained from formal meetings with community leaders, in order to understand what towns and villages need first and foremost to rebuild or make life better. The actual work will, where possible, be undertaken by locals themselves thus creating work, civic pride and an ethos of sustainability. A large section of the course so far had involved lectures and indoor exercises. Guest speakers came from a wide sphere, including individuals newly returned from theatre, Sandhurst lecturers and subject matter experts. It has also been necessary to ‘improve’ our fitness; the average age of the students is……erm…..early forties. One of the most interesting weeks was when we were trained as Team Medics by RAMC personnel. This I feel did bring home some of the realities to many of us but also has given a vital tool to all of us should these skills be required. The training we received was intense but interesting and as a wider group of strangers only a short time ago, we are now a forty strong conglomerate of working teams. 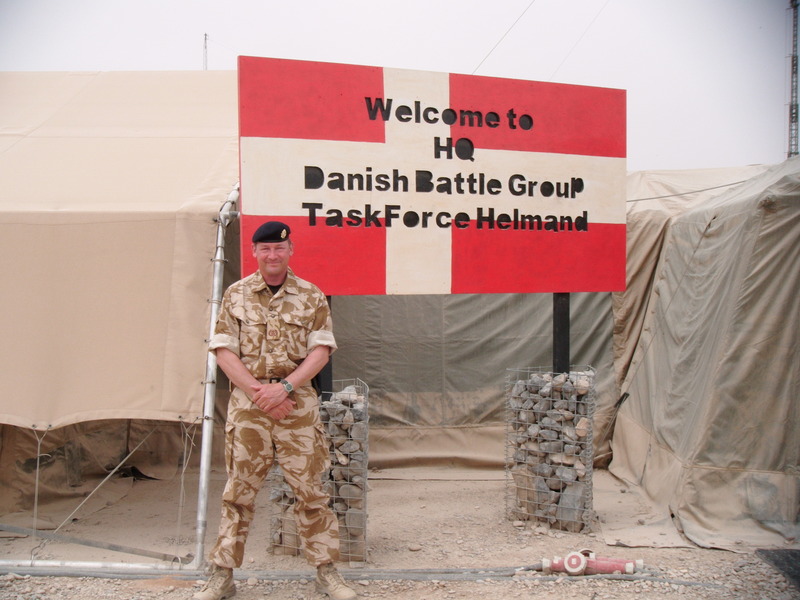 I was headed for Gereshk in Helmand Province, and a patrol base run by Danish soldiers, working as part of Task Force Helmand, which has proved to be one of the most “active”. The living is hard. There are no luxuries, not even the food which is all rations, although we can alternate between British and Danish fare. We live in a small room with only one electricity point, which has at times been like a furnace as the temperature hit the high forties. I have a campbed and a mosquito net – and an absolutely essential fan. We share our PB with the ANA and when we patrol we patrol with them. It has been one of the most amazing experiences of my life. In the next blog I will start to give you a taster of the “real” Afghanistan.